The best train ride I’ve ever taken was May 17, 2002, from Boston to Philadelphia. I know this because that’s the date I wrote on the inside cover of Magical Worlds of the Wizard of Ads: Tools and Techniques for Profitable Persuasion, by Roy H. Williams – the book that mesmerized me for the entire trip. Perusing the book again last night, I came across a note I wrote in the margin on page 136: “The best advice on work-life balance I’ve ever read.” I’d like to share with you a shortened version of this classic, two-page essay, entitled, Look Out The Other Window. The entirety of what follows is in Roy Williams’ words. Like most people, our friend Akintunde had been confusing rest with idleness. Rest is not idleness. Rest is simply looking out a different window. 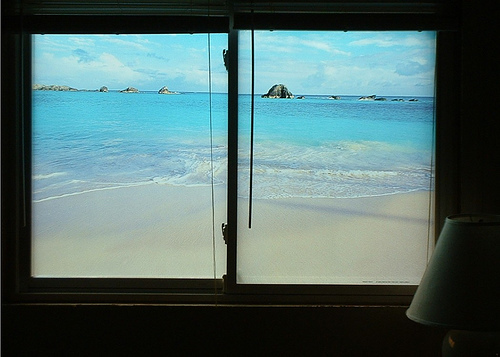 If you have a job, or anything else that you struggle with and worry about, you have a window that looks to the east. But do you have one that looks to the west? This entry was posted in Books, Creativity, Effectiveness, Family, Health, Life, Parenting, Productivity, Success, Work. Bookmark the permalink. WOW what a great posting!! Thanks for that & I will be sure to share your blog with others! RLC. I have trouble not looking to the west, even when I need to be looking to the east. In general, I feel just fine about that. Though I suppose that sometimes those who work for me must (or, more appropriately, who look to the east for me) get a little frustrated. Hey Benny, what do you see when you look to the West during the time you’re paid to look to the East? Just curious….